Knee flexion and extension deformities are common and disabling. They have many causes, including congenital contractures, deformities from neuromuscular disorders, trauma, and infection. This deformity is often associated with other conditions, such as arthrogryposis, spina bifida, developmental hip dysplasia, and clubfeet. In many cases, the child was born breech. Pathology The pathology depends upon severity. In dislocated knees, fibrosis of the quadriceps muscle, absence of the suprapatellar pouch, and valgus deformity of the knee are often present. Evaluation Look for other abnormalities. Make a radiograph of the pelvis to make certain the hips are not dysplastic or dislocated. Ultrasound or MRI imaging may be necessary to assess the knee. Grade the severity of the deformity. Management Manage by gentle stretching and casting or by using the Pavlik harness if the knee can be flexed to 60°. 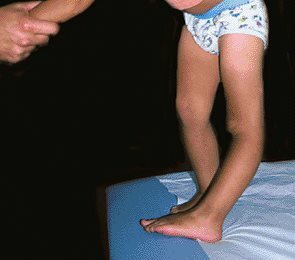 For knee dislocations, perform a quadriceps lengthening at about 1–3 months of age. Immobilize in 45° of flexion to avoid skin problems. Apply serial casts to achieve about 90° of flexion. Maintain this correction for one month. Consider correction of other deformities, such as hip dislocations and clubfeet, concurrently. If treatment is delayed, management is more difficult. Limited quadriceps lengthening may move the arc of motion into a more functional plane. In older children or adolescents, bony deformity may require flexion osteotomy to improve alignment. Prognosis The outcome is primarily determined by severity. The prognosis is generally better for unilateral cases and those not associated with some underlying syndrome. Bony deformity of the upper tibia usually results from trauma to the anterior proximal tibial physis. This portion of the physis is vulnerable to arrest. Recurvatum has been reported following traction, spica cast immobilization, proximal tibial traction pin placement, femoral shaft fractures, and meningococcal infections. Evaluation Make radiographs of the upper tibia with a true lateral study to assess articular inclination. Note that the tibia is usually inclined posteriorly by about 9°. Assess the status of the growth plate with MRI or CT scans. Management Consider resection of physeal bars of the anterior tibia if two years of growth remain. At the end of growth, correct the deformity with a opening wedge osteotomy just proximal to the insertion of the patellar tendon. Congenital and acquired flexion contracture deformities are common in children with neuromuscular problems. Acquired deformities result from imbalance between the quadriceps and hamstrings. Flexion deformity is common in arthrogryposis, cerebral palsy, and myelodysplasia. Correct deformities early by soft tissue procedures. Attempt to prevent recurrence by night splinting in extension. If recurrence occurs, regain correction by serial casting. If unsuccessful, try to delay correction until the end of growth, if possible. Then perform correction by a bony procedure. Avoid correction by osteotomy during growth, as bone remodeling will result in the deformity recurring. Delay bony correction until the end of growth to provide a correction that is most likely to be permanent.